There's another Resident Evil film in the pipeline for next year. So now is as good a time as any to see how the previous films compare to the games. While not brand new, the image below was recently uploaded to 2ch, Japan's largest internet forum. It's an excellent look at how the film actors stack up against the original game characters. 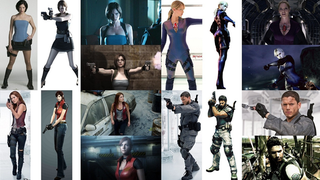 Note that these aren't all the actors (Albert Wesker, for example, was played by different actors.) Still, some of them are dead ringers. Others are, ahem, not.